Is there anything more all-American than jeans? 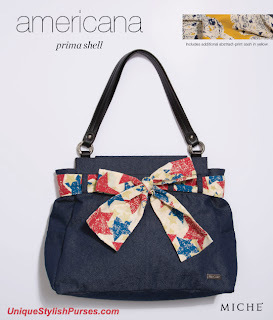 The Americana for Prima Miche Bags features dark blue denim fabric with removable cotton star-print sash in patriotic colors. 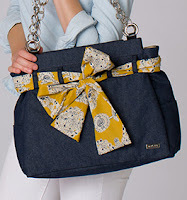 She also comes with an extra satin/silk abstract-print sash in yellow so you can enjoy a whole new look for your Americana whenever the mood strikes. Fun! Side pockets.